The subscribers of Globacom were very happy when the special data offer of 1.2GB for just ₦200 was introduced to the extent that most people abandoned expensive data subscriptions for this small money big data. With the hope that the plan we last longer, but it is so unfortunate that the Glo special data offer ₦200 for 1.2GB has been ceased for reasons best known to them. Presently, when you dial *777# and you reply with 1 and 1 to get the special data offer, it's only present you with Campus booster which is not recommendable at all. The Special data offer has been extracted from the list. 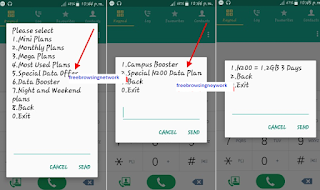 Alternatively, you can go for Glo Exclusive Offer of 2.4GB for just ₦500 and if you still curious about getting huge data for that same amount of ₦200, that means you need to cross to another network, you either go for 9mobile 1GB for ₦200 or MTN 1GB for ₦200 which according to some users, its SIM selective. What do you have to say about this Glo special data offer unsatisfactory termination? Comment on "Sad News, Globacom Terminates Special Data Offer Of 1GB For ₦200"